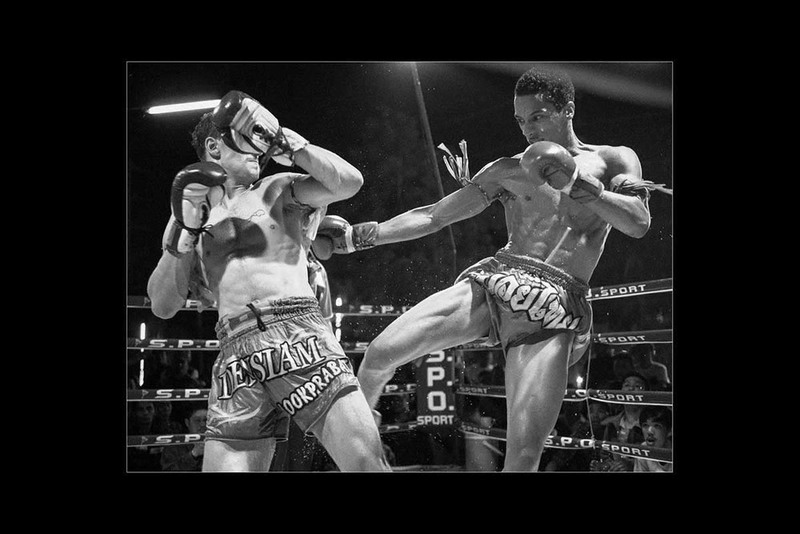 Femi is currently training and competing full time in Thailand under instruction from Honour Muay Thai gym in Ao Nang, Krabi. This unfortunately means he is currently unable to conduct sessions however please feel free to enquire about recommendations for local trainers. You can keep up to date with Femi’s competitions via HonourMuayThai on facebook and instagram. The Current ISKA British Champion. Personal Trainer & Muay Thai Instructor. Hello and welcome to my website. My name is Femi Akinade and I am the founder of Khao Jai Muay Thai. This is my 'about me' section where you can find out more about my background as a fighter and personal trainer. I am the reigning ISKA Light Welterweight British Champion and one of the top Muay Thai and K1 light welterweight competitors in the UK & also a qualified Personal Trainer certified by Active IQ and the Register of Exercise Professionals. Over the past 11 years I have been competing internationally including several fights in Thailand's famous Rajadamnerm stadium. I have trained with and alongside multiple world champions and in the last 12 months alone I have achieved success both internationally, defeating opponents from Brazil, Italy, Spain and Thailand, and Nationally competing on several of the UK's biggest promotions including Smash Muay Thai and the Super Fight Series Championships. I am also the 2014 Nak Muay Series 4 man tournament winner. I have been practising Muay Thai for 12 years now under Kru Will Kelly and Kru Simon Wells of Diablo gym in Barnet, North London and it was under their guidance that I received my instructor certification after demonstrating that I was worthy of carrying on their great lineage. Since then I have been training fighters and non fighters of all levels both one to one and in group sessions. I have also run several Thai boxing classes for various health clubs but now focus more on private lessons although I do still teach Muay Thai classes occasionally. Muay Thai is my life and my passion. I love to share this art with my students and I love to see others enjoying Muay Thai as much as I do. I work with people from all levels, genders and social backgrounds from your working mum who's a complete beginner but wants to blow off some steam while staying in shape to competitive athletes preparing for their next contest. I began studying fitness instruction and personal training in 2012 in order to have a wider and deeper understanding of the science behind exercise, as well as a better understanding of human anatomy and physiology and nutrition. The knowledge I have gained and continue to gain has been invaluable both in my own training and fight preparation and in helping my clients achieve their various goals. I am currently working towards my 2nd and 3rd nutrition qualifications. As a fighter I regularly have to lose up to 10kg within 4 - 8 weeks whilst maintaining strength and lean muscle mass and also ensuring I have enough energy to train intensely twice a day so a thorough understanding of nutrition is extremely important. Below for your convenience I have listed some of my awards and relevant qualifications. Please feel free to contact me via email or phone if there is anything else you'd like to know or if you'd like to book a trial session. Connect with Khao Jai Muay Thai Gym! Khao Jai Muay Thai caters for all your health and fitness goals. All personal training sessions are conducted in a private studio or in the park opposite if the sun is shining. fee of £20 to cover travel costs and time. Have been in the game 30 odd years and haven't seen anyone as technically good as Femi. Quality fighter and awesome coach. I was introduced to boxing a few years ago through my personal trainer; the aim was to bring a different form of cardio into the routine. I liked it very much right away. I started training with Femi about a year later, when I realised there was so much I didn't know and most annoyingly so many techniques I had been doing incorrectly for a year. Training with an actual fighter is a different ball game to what other personal trainers will teach you. Femi will not let a single mistake go and will ensure you learn it properly. As frustrating as this may get at times, once you are up to speed you will start enjoying boxing for what it really is and much more so then just mock-boxing with a regular personal trainer. I very much like the fact that, with Thai boxing, your mind is engaged as much as every single muscle in your body. During my boxing sessions with Femi I experience an hour of freedom of mind - free from every other distraction and all the stress my hectic daily job brings along with it. Not to mention what those endorphins after an hour of boxing do for you! Now after a couple of years, I am amazed by how much Femi still has to teach me such is the extent of his knowledge and skill. I would very much recommend training with Femi, whether your aim is to learn how to fight professionally or to get fitter and introduce new skills into your training routine. Muay Thai training with Femi has been a great experience from the start. Myself and a friend joined up for joint sessions as we'd attended group classes at a local martial arts centre but didn't feel that we were learning any proper technique at all. This was then demonstrated by how much we were able to improve in just a few classes with Femi - 8 months have now gone by and even only training once a week both my overall fitness and Muay Thai technique has gone from strength to strength. I've been training with Femi for over a year now, as a result I've got much more confidence in my technique and my overall fitness has improved greatly. Working on a one to one basis with Femi is without doubt a wise investment of my time and money! I have been training with Femi for 3 years now and he has made a huge difference to my physique and fitness levels. My body is toned and has definition. I seem to have endless amounts of energy and lead an extremely busy and active life as a consequence. I am 52 years of age and when I first started training with Femi I was very thin. I am still petite but with a much curvier and defined figure now. As well as training me, Femi helped me with eating the right foods at the right time in order to improve my muscle mass. For me the evidence speaks for itself and I really look forward to my sessions with Femi. He is extremely skilled and knows just how to motivate you to keep striving towards your goals. He made learning and practising Muay Thai great fun. I have trained and previously fought in Thailand so knew of Femi's ability as a fighter, where he's trained in England and Thailand and where he's fought (Elite level in Bangkok!). After I got an injury out there I came home and looked Femi up when I was able to train again, He has helped me get back to fitness and massively improved my technique, Femi's a good guy and his fighting quality's definitely transfer over to his training, he has a certain way of getting things over to you, If your looking to get in shape or even fight in the future then I'd advise checking Femi out..Nice one Femi! Great sport taught by a genuine guy. The good thing about working with Femi is that he pushes you according to what he knows you can achieve. Excellent knowledge of the art and able to explain it simply and effectively. Highly recommended. Femi Akinade is currently training/competing full time in thailand.